I realize I am a day behind but things never really go as planned here! Had a crazy busy weekend hanging out with my awesome cousin who is getting married in June! We worked on a couple of things for the wedding and a fun project for a baby shower she is doing. Went to G's dodgeball game, did some thrift shopping, went to church, did lots of laundry and just kept busy! Yesterday the school called and I had to go pick up G with a stomach ache and bad sinus headache. Took him to the Dr because he had been up late Friday with the same symptoms and found out he had a sinus infection and the mucous was causing the stomach pain. So now he is on antibiotics and hanging out at home today! 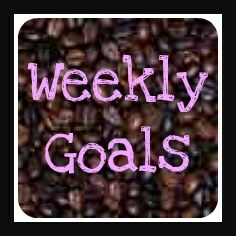 On to the Weekly Goals! I did not get 7 things crossed off last weeks list but considering the week was a bit crazy I am happy to mark a few things off. I am also seeing some things on my list that I seem to be having trouble with so I am going to change things up this week and see if that makes it more do-able. 6. Re-read chapters 1 & 2 in A Woman's Guide to Overcoming Depression and make some notes! 7. Get dining room de-cluttered and ready to move in new desk. - not all the way done, but progress was made! 10. Create 2 items to sell and post on business page -Karla Creative - I have a kitchen item and a baby set that I am wanting to make, just need to make the time! Going to see if this will be a little easier for me to follow. Previously there were some things I thought would be great for us (or me) to do as a family but just weren't a great fit for us. This is a learning process for me and I am going to figure it out at some point!